Xara offers very easy integration with Jotform through the use of widgets. To get your Jotform form into a Xara page, do the following. Drag the JotForm custom forms widget out of the Form Widgets section of the Designs Gallery and on to your Designer Pro 6 or Web Designer 6 web page. The JotForm page will open in the Create New Widget: JotForm window. Click the new form button and follow the wizard. Select one of the options as you would normally do. Once you have a finished form, you'll want to share it. Click the "Publish" button. 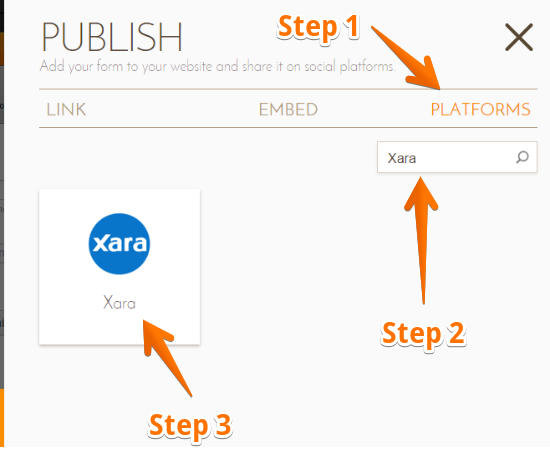 In your Publish wizard, click "Platforms" and search for "Xara". You can follow the instructions mentioned in the wizard, or you can also proceed on step 4 below. Click Insert in the Create New Widget window. Xara Designer Pro 6 or Web Designer 6 will display a placeholder for you form. Click and drag the placeholder to the location on the web page where you want the form to appear. If you need to do any resizing take note that you cannot resize the placeholder using the selection handles - this will truncate your form (if you reduce it) or create empty white space to two sides of it (if you enlarge it). To resize the form, go back to JotForm, click Setup and Embed, click Preferences and then click the Form Styles tab. Once you've done this you'll need to reimport the form into the placeholder, so just repeat set 4. 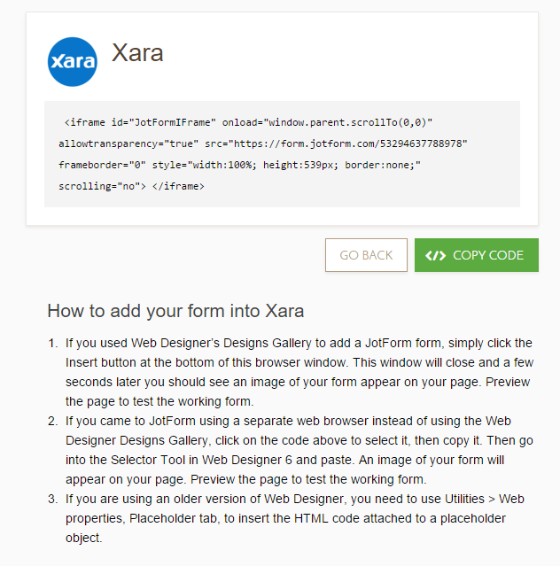 I have followed these instructions many times and i am still getting only half my form..also i have tried putting a place holder into my web page and replacing it with the code i copied from the code xara widget had created, basically doing it manually and had the same problem only showing half of form. This is grinding me down at moment as it is preventing my business site from going live. can anyone help Pleasesssssss. When I drag the JotForm to my Xara design it says "Sorry, we do not support Internet Explorer 6 anymore. In order to provide better service and keep up with the new technologies we had to drop IE6 support. You should upgrade your browser to a newer version. Internet Explorer has been deleted from my computer and I use Chrome???????? EXPLAIN PLEASE. I can build and import a Jotform form into Xara using the Xara interface. However, if I try to change anything in the form design, new field, change title, form width etc etc, Xara does not recognise the changes and simply imports the old version.. I am saving changes as I make them. I have even logged into Jotform direct, made my changes, saved them then logged out. Launching Xara and then trying to import the new form only results in the old version being imported. I am using Windows 7, trial version of Xara 6 and Firefox 5.